If you've ever wrestled with an unresponsive iPhone home button or Wi-Fi kit that flat-out refuses to connect, you'll know that technology can infuriate as much as it entertains - so why not let it infuriate your enemies? We've picked the perfect products for passive aggression, ten tech tormenters that enable you to be incredibly generous and unspeakably evil simultaneously. If you know of a truly terrible bit of tech we've missed, do let us know. Other than saying "you're a dork", nothing says "you're a dork" quite like the TV hat, an enormous hat that resembles a cross between a burqa and a small family hatchback. The idea is simple: stick your iPod, Android phone or Zune - Zune! of course they have a Zune! - in one end, put the contraption on your head, and pretend you bought a proper pair of video glasses instead. If, as the manufacturer's site suggests, you take it camping, you'll be eaten by bears. Puppy Tweets is an intelligent dog tag system that enables dogs to use Twitter. We're not making this up. This one can offend in two ways: first, by suggesting that the recipient is just the kind of dullard who thinks having their dog tweet is a brilliant idea; and secondly, if you give it to someone who doesn't have a dog, it'll really confuse and annoy them. There's a whole world of insults in this gift choice: you're telling the recipient that they're vain and that they're rubbish at shaving, and the insult-o-meter really goes off the scale if the recipient is a girl. The only way this one can backfire is if the person you give it to thinks it makes them look like Bane from The Dark Knight Rises. Which, let's face it, isn't very likely. Yours for around £39.99 via the magic of Buy It Now, Kangol's Rhythm jacket keeps the rain off and the music going: in addition to must-have features such as sleeves, it also has machine-washable integrated speakers. It's clearly designed for people who find headphones too complicated and frightening and who think a cheap PAYG mobile makes a banging sound system. Yes, £88ish is quite a lot of money when a piece of paper with YOU IS FAT written on it is free, but we prefer the subtle stiletto between the shoulder blades to the big old sledgehammer in the face, and an expensive weight-related gadget is a particularly despicable thing to give somebody as a gift. Plus, you can always write BECAUSE YOU IS FAT on the box. No, not the UK one, if it ever ships - we mean the US one. Despite its Android origins the Kindle Fire is really designed to do one thing and one thing only: connect to Amazon's mothership to access its enormous, US-only library of content. Giving one to somebody in the UK who doesn't have a US Amazon account is a one-two punch of tablet joy followed by no-content disappointment. Given its many joys, the Virgin Media TiVo is an odd one for our list - but then you handle the remote, and it all makes sense. Designing remotes isn't hard - "take a stick. Put some buttons on it" - and yet the TiVo remote is only comfortable if you're a squid, with the lower buttons in particular only usable by contortionists. You're not giving someone a sweet, sweet DVR; you're giving them a lifetime of hand pain. Is there anything nicer than the look on someone's face when you give them an iPad? Yep: the look on their face when they get closer and see it's a NotPad, a sixty-page paper notepad with an acetate front sheet that makes it look like Apple's tablet. You can get the same effect with a BlackBerry Playbook, but at £2.40 from Debenhams the NotPad's slightly cheaper and probably more useful. 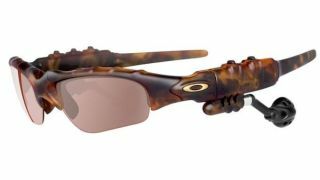 Officially discontinued but still widely available, Oakley's various Thump sunglasses stuck MP3 players inside otherwise attractive eyewear in much the same way mad scientists might combine a loaf of bread with Uma Thurman. Limited capacity, unimpressive sound quality and less than brilliant battery life mean the Thumps will almost certainly disappoint. You can see the logic: hands-free headsets aren't really hands-free, because they're additional bits of hardware. A truly hands-free headset would take your smartphone and stick it on your face with the aid of suction cups and a headband. That's exactly what GoJo does, with predictably awful results.